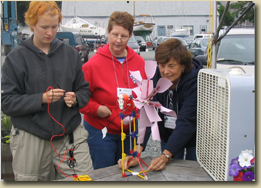 HOBBES is Lead Organization in the MITS Summer Institute, a two-week summer program for K-8 teachers designed to encourage inquiry-based teaching in a supportive and stimulating atmosphere. Teachers - engage your minds and hands in the process of inquiry, while gaining methods, materials, content and connections with standards-based activities for your classroom. Join HOBBES and the Peabody Essex Museum, Mass Audubon, the Essex Shipbuilding Museum, Schooner Adventure, MIT Sea Grant and the Gloucester Maritime Heritage Center for ten days that you won't forget. Check our calendar for upcoming program dates.